A300-600:which is officially designated as A300B4-600 has the same length with the B2 and B4 versions but has improved space because it uses the A310 rear fuselage and tail. It has greater power CF6-80 or Pratt & Whitney PW4000 engines. It was started to be operated in 1983 by Saudi Arabian Airlines. A300-600: (Official designation: A300B4-600) The baseline model of the -600 series. 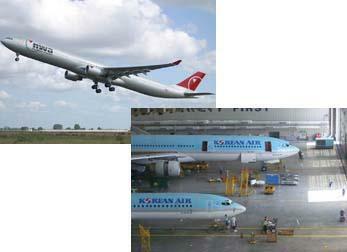 The versions of this aircraft are A300-620C, A300-600F, A300-600R, A300-600RF, A300-600ST. Length 54.08 m or 177' 3", Span 44.85 m or 147' 2", Height 16.62 m or 54' 6"